"The reason of starting a (Dutch) soccer club in the USA is that there are 18 million soccer players in the USA (the most in the world) and although the Americans dominate almost every sport, there are almost no US players performing at the world’s top level. We feel this is due to a lack of tactical development, something the Dutch school is known for worldwide." It's funny how far the internet can take you and the tricks it can play on your mind. I read that corporate statement last year when curiously pulling back the curtain on the USL Pro division. The realization that a prominent Eredivisie club operates a team in Ohio merely solicited a "hm. that's interesting" last year while this year it has me pulling out Simon Kuper/Stefan Szymanski's Soccernomics and questioning the future role Americans play in the global game of Soccer. Why? 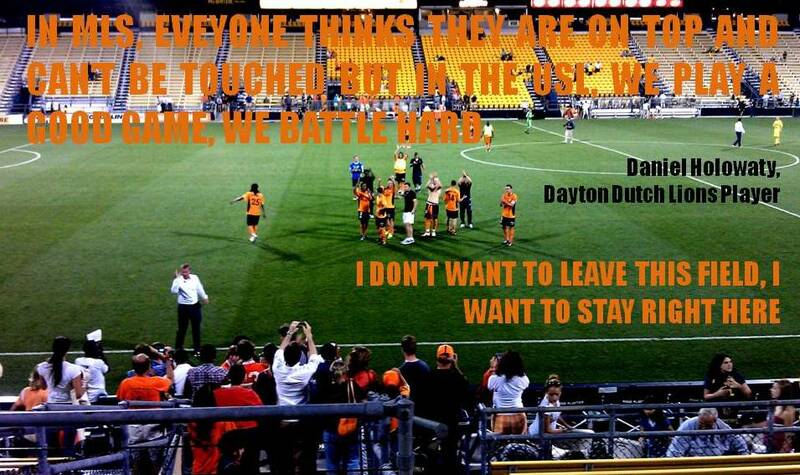 So called "top division" side Columbus Crew fell to so called "division III" side Dayton Dutch Lions. There are a couple "so called" forces at work here. First. Erik Tammer and Mike Mossel. 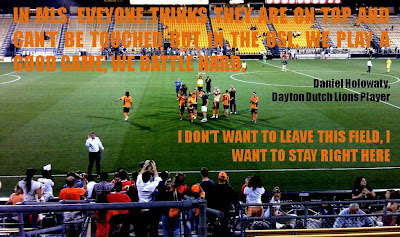 Two business savvy soccer playing Dutchmen that bridge the gap betwixt the Dayton Dutch Lions and FC Twente in Holland. Second. And this is what has me questioning the trajectory of soccer in this country... Foreign clubs see the United States (Turkey and Hungary) as massive talent pools to exploit on a grassroots level. It was clear that Columbus entered this game with serious intentions of winning after last years lackluster loss to the Richmond Kickers. The demeanor of the Crew players was evident. They wanted this game. So with - Ethan Finlay and Olman Vargas up top. Cole Grossman prowling the middle, Kevan George right behind him. Justin Meram and Chris Birchall out wide... Shaun Francis, Eric Gehrig, Julius James (c) and Perry in the back - The Crew went to work. Columbus controlled most of the action. You could see Dayton speculating and venturing out a bit to see what the Crew had in terms of talent but only a bit. 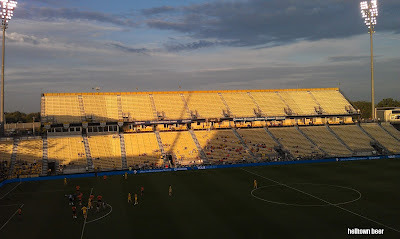 The script was written for this one around the 40th minute: Dayton would bunker down and only work the counter from then on and turn Columbus into exactly the team it is not: A possession oriented club with solid finishing. Crew coach Warzycha was forced to make some subs and changes as the game wore on. Finlay up top was a mistake. Meram was moved up at some point in the first half in what is basically an admission of mistake by Warzycha. Francis had to come out for injury and was replaced by Josh Williams in the left back spot. These changes are red flags to any Crew fan. When you see players swapping spots betwixt mid field and forward and a central defender coming in as a LBW in this type of formation? you have a problem. Columbus did become more dangerous with Meram up top. He had an excellent chance midway through this half but the Lions' GK was up to the task. The only Crew goal came off a questionable handball in the box (naturally). Vargas stepped up and drilled it home in probably the worst thing that could have happened to the Crew. Confidence grew in the Crew but they lacked pieces in the right positions to capitalize on it. Vargas was off. Meram had been run ragged in the mid field and Finlay? well, Finlay is proving to be a frustrating character. The Crew wanted another goal but fell to a exquisite counter by Dayton around the 70th minute. One to one. After that the 1,500 folks on hand saw a desperate Crew team push for yet another and laughably got beat by basically the same sequence of events. Dayton pulled off another. 2-1. Game. • Finlay really struggled up top again. I'm not sure how many more passes this guy gets. I read a lot on this match and it seems like Crew writers/bloggers like him but he is not dangerous right now. I see the arms pumping. The huff and puff. The heart. But not the comfort level nor the skill. • Julius James. First game back and had the Captains armband. Got burnt on both goals which were really the only time he, Gehrig or Matt Lampson were tested. • Josh Williams at left back? He was the only player out there last night that I felt was bigger than the game. Chris Birchall, almost but he disappeared for long spells. • Columbus subbed on Renteria and Anor late but it was too late. The only thing it showed me was the skill these guys have. Both of them made it seem like men against boys. Problem was they only got about 10 minutes. 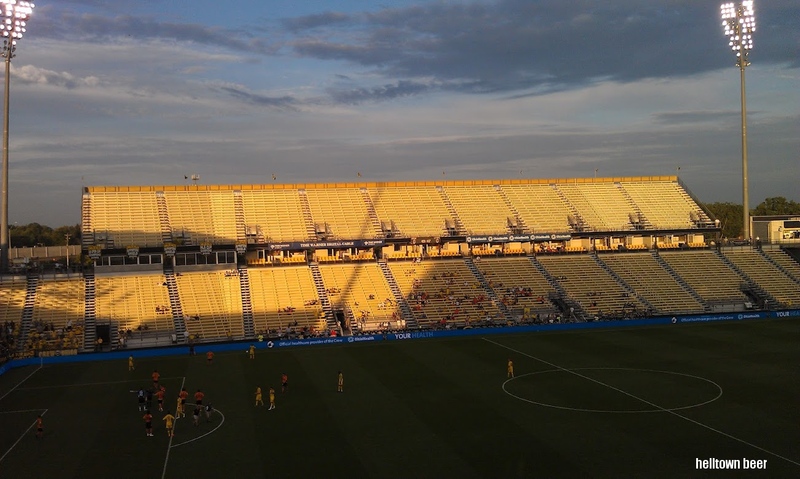 • Crew were only 1 of 7 MLS teams that went down yesterday during this year's Cup. I'd like to think this was due to something other than the fact that MLS is not organized in a way that rewards the best and harshly punishes the worst. Unfortunately, Major League Soccer does a great job at only achieving "average". As such, followers of the league should expect nothing but. It's like one of those stories in books and movies about a seemingly random crime turns into a much deeper rooted web that leads all the way to the top world leaders. This is also, perhaps, merely the beginning of a topsy turvy US soccer environment that we might as well get use to.